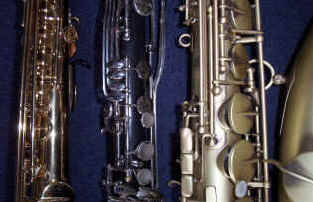 Principal instruments soprano & tenor saxophones. Doubling bass clarinet, other saxophones, occasional flute and an original WX7 wind synth. Stuart considers himself a soprano saxophone specialist, having switched from clarinet on acquiring his first horn in 1970 (a 1920's Selmer 26 for £15!). Struggling with that for years taught him most of what he knows about intonation. New project out and about from Summer 2019; Groove Crusade: The Music of the Crusaders. Great sextet playing new arrangements of the work of the great Texan jazz-funk-soul band. New weblinks and more details to follow. Tangent. Function/Corporate Hospitality. Within the traditions of 20th century popular music, ensembles arranged to meet most budgets and circumstances. Jazz, soul, funk, pop, & sensitive background music for weddings, civil partnership ceremonies, conferences, product launches, parties and special occasions. (Click link at start of this paragraph for more information). Chameleon. 1982-2015. Archive information only. Northumbria Saxophone Quartet. Archive information only Playing repertoire encompassing everything from funk to opera, township jive, chamber music and commissioned work. Gerry Richardson's Big Idea. Fantastic nine-piece soul-jazz band led by Hammond organ virtuoso & long-time Sting collaborator. Great gig review from 'The Independent', April 2010, here. Band website here. The James Taylor Project. 2008 -10. Archive information only. A trio with guitar-vocalist Brian Dales interpreting the work of the great singer-songwriter James Taylor and his principal collaborators. (Click link at start of this paragraph for more information). Chameleon 2006. The Quartet:Tim Franks, Drums; Avril Greenhow Parker, Piano; Stuart Johnson, Reeds; Joel Allison, Bass. Chameleon 2007. The Sextet: Avril Greenhow Parker, Piano; Tim Franks, Drums; Pete Martin, Trumpet; Stuart Johnson, Reeds; Dave Turner, Bass; Mark Townson, Guitar. 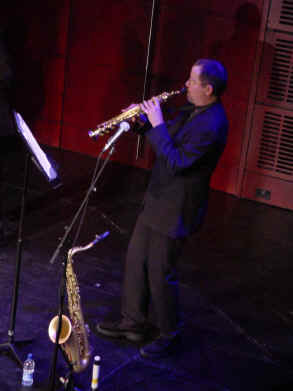 Left: At The Sage Gateshead with NSQ, December 2004. Centre: At Hospitalfield, Arbroath, with Gerry Richardson's Big Idea, March 2005. Right: At Zeffirelli's, Ambleside, with Chameleon, February 2006. Public performance archive. Private functions excluded from this listing. Tuesday, December 16th, 2014. Bayvox Community Choir/Tangent. Christmas concert. The Victoria, Whitley Road, Whitley Bay, North Tyneside. 6.30pm. Friday, November 28th, 2014. Tangent. George & Dragon, Clifton, Cumbria, 8.30pm. Wednesday, November 12th, 2014. Trefor Owen Quartet. Kendal Jazz Club, Hawkshead Brewery, Staveley, Cumbria. 8pm. Review here. Sunday, August 31st, 2014. Tangent. Bertram's Restaurant, Woodland Spa, Burnley, Lancashire. 7pm. Thursday, August 14th, 2014. Chameleon. Number 39 Hopstar Brewery Tap, for Darwen Music Projects, Darwen, Lancashire. 9.00pm. Friday, May 9th, 2014. Chameleon. The Bold Hotel, Lord St., Southport, Merseyside. 8pm. Part of Southport Jazz Festival 2014. Saturday, March 8th, 2014. Compass Quartet , feat. Willy Fluss, guitar & Neil Harland, bass. Zeffirelli's, Ambleside, Cumbria. 8.30pm . Tuesday, December 17th, 2013. Bayvox Community Choir/Tangent. Christmas concert. The Victoria, Whitley Road, Whitley Bay, North Tyneside. 6.30pm. Saturday, November 16th, 2013. Chameleon. Zeffirelli's, Ambleside, Cumbria. 8.30pm. Friday, October 11th, 2013. Compass Trio, feat. Willy Fluss, guitar, Bertram's Restaurant, Woodland Spa, Burnley, Lancashire. 9pm. Saturday, September 28th, 2013. Tangent. Bertram's Restaurant, Woodland Spa, Burnley, Lancashire. 9pm. Friday, August 23rd, 2013. Gerry Richardson's Big Idea. Drystone Stage, Solfest, Aspatria, Cumbria. 9.30pm. Saturday, August 17th, 2013. Tangent. Bertram's Restaurant, Woodland Spa, Burnley, Lancashire. 9pm. Saturday, August 10th, 2013. 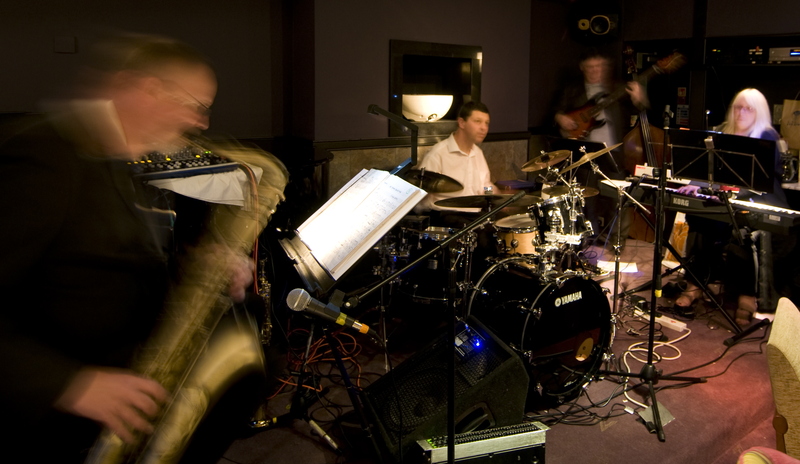 Gary Boyle-Stuart Johnson- John Sandham Trio. Bertram's Restaurant, Woodland Spa, Burnley, Lancashire. 9pm. Friday, July 26th, 2013. Compass Trio, feat. Willy Fluss, guitar, Bertram's Restaurant, Woodland Spa, Burnley, Lancashire. 9pm. Saturday, June 29th, 2013. Chameleon. Zeffirelli's, Ambleside, Cumbria. 8.30pm. Rescheduled from March 23rd's snowbound cancellation. Saturday, June 1st, 2013. Chameleon. Jazz by Moonlight, Heath Hall, Heath Common, Wakefield, W. Yorkshire. 7.30pm. Headliner; Snake Davis Band. Saturday, May 25th, 2013. Tangent; 'Everything you ever wanted to know about jazz ... and some things you didn't!' Kirkmahoe Concerts 'One Day In May', Kirkton Church, Nr Dumfries, Scotland. 3.00pm. Part of Dumfries & Galloway Arts Festival 2013. Friday, May 10th, 2013. Chameleon; The Coronation, Southport, Merseyside. 9.00pm. Part of Southport Jazz Festival 2013. Tuesday, April 23rd, 2013/Dydd Mawrth 9 Ebrill. Gary Boyle Quartet; North Wales Jazz Society, Royal British Legion, Llay, Nr. Wrexham, N.Wales. 8.30pmtoday. Tuesday, March 19th, 2013. Tangent; 'Everything you ever wanted to know about jazz...and some things you didn't!'. Riverside Lodge, Morpeth, Northumberland, 7.30pm. Sunday, January 6th, 2013. Tangent (Duo). Wedding Fair, Netherwood Hotel, Grange-over-Sands, Cumbria. 11.00am - 4.00pm. 2012 Chameleon's 30th birthday year. Tuesday, December 18th, 2012. Bayvox Community Choir/Tangent. Christmas concert. The Victoria, Whitley Road, Whitley Bay, North Tyneside. 6.30pm. Monday, December 10th, 2012. Gerry Richardson's Big Idea; 'So Many Reasons'; new album launch. The Sage Gateshead, 8.00pm. Concert footage. Saturday, October 13th, 2012. Trefor Owen Quartet. Zeffirelli's, Ambleside, Cumbria, 8.30pm. Thursday, August 9th, 2012. Chameleon. Number 39 Hopstar Brewery Tap, Darwen, Lancashire. 9.00pm. Part of Darwen Jazz & Blues Festival 2012. Sunday, August 5th, 2012. Brian Acton Trio. The Shireburn Arms, Hurst Green, Lancashire. 1.00pm. Saturday, August 4th, 2012. Chameleon. Zeffirelli's, Ambleside, Cumbria. 8.30pm (New date for February 4th's cancelled performance, below). Saturday, June 30th, 2012. Trefor Owen Quartet. Zeffirelli's, Ambleside, Cumbria. 8.30pm. Tuesday, May 29th, 2012/Dydd Mawrth 29 Mai. Trefor Owen Quartet. North Wales Jazz Society Royal British Legion, Llay, Wrexham, N. Wales. 8.30pm. Wednesday, March 28th, 2012. Chameleon. Town Hall, Bishop Auckland, Co. Durham. 8.00pm. Saturday, February 4th, 2012. Chameleon. Zeffirelli's, Ambleside, Cumbria. 8.30pm. Cancelled due to severe winter weather. Rescheduled for Summer 2012. Please check back. Sunday, January 8th, 2012. Tangent (Duo). Wedding Fair, Netherwood Hotel, Grange-over-Sands, Cumbria. 10.00am - 4.00pm. Saturday, December 31st, 2011. Tangent (Duo). Netherwood Hotel, Grange-over-Sands, Cumbria. 6.00pm-9.00pm. Part of New Year's Eve event; books up fast. Sunday, November 13th, 2011. Tangent (Duo). Wedding Fair, Rheged, Penrith, Cumbria. 10.00am - 4.00pm. Saturday, October 15th, 2011. Chameleon. Lancaster Music Festival. Funk Stage at The Gregson. 7.00pm-9.00pm. Saturday, October 1st, 2011. Chameleon. Zeffirelli's, Ambleside, Cumbria. 8.45pm. Saturday, August 20th, 2011. Trefor Owen Quartet. Zeffirelli's, Ambleside, Cumbria. 8.45pm. Saturday, February 12th, 2011. Chameleon. Zeffirelli's, Ambleside, Cumbria. 8.30pm. Saturday, November 20th, 2010. Tangent. The Netherwood Hotel, Grange-over-Sands, Cumbria, 7.30pm. Charity event incl. the Pipes & Drums of the Gurkha Regiment. Saturday, November 6th, 2010. Chameleon. Zeffirelli's, Ambleside, Cumbria, 8.30pm. Saturday, October 30th, 2010. Chameleon. Lanercost Cricket Pavilion, Lanercost, Cumbria. 8pm . Wednesday, October 6th, 2010. Gerry Richardson's Big Idea feat. Sting. Invitation-only concert on Tyneside. Set list here. Sunday, August 22nd, 2010. Chameleon. Darwen Jazz & Blues Festival. The Bridgewater, Darwen, Lancashire 4.00pm. Saturday, August 21st, 2010. Chameleon. Zeffirelli's, Ambleside, Cumbria, 8.30pm. Saturday, May 8th, 2010. Chameleon. Zeffirelli's, Ambleside, Cumbria, 8.15pm. Sunday, March 28th, 2010. Tangent. Wedding Fair; Netherwood Hotel, Grange-over-Sands, Cumbria. Various times 1130-1600 (Duo). Saturday, March 27th, 2010. Gerry Richardson's Big Idea. Gateshead International Jazz Festival. 10pm. National press review here. Sunday, March 21st, 2010. Chameleon. The Sparrowhawk, Burnley, Lancashire. Cancelled due to venue closure. Thursday, February 4th, 2010. Chameleon. The Black Horse, Darwen, Lancashire. 9pm. Saturday, December 19th, 2009. Chameleon. Zeffirelli's, Ambleside, Cumbria. 8.15pm. Thursday, December 17th, 2009. The Sage Gateshead's 5th Birthday Celebration, with Andy Sheppard & Choir, 5pm. Sunday, December 6th, 2009. Chameleon. The Sparrowhawk, Burnley, Lancashire, 1pm. Tuesday, November 24th, 2009. Chameleon.The Puzzle, Sowerby Bridge, W. Yorkshire. 8.30pm. Friday, October 30th, 2009. Chameleon. The Aspinall Arms, Mitton, Lancashire. 9pm. Saturday, October 10th, 2009. The James Taylor Project. The Acoustic Tea Room, Kirkby Stephen, Cumbria. 8.30pm. Saturday, August 8th, 2009. Chameleon. Zeffirelli's, Ambleside, Cumbria, 8.15pm. Sunday, July 19th, 2009. Chameleon. The Sparrowhawk, Burnley, Lancashire, 1pm. Saturday, May 9th, 2009. Gerry Richardson's Big Idea. Zeffirelli's, Ambleside,. Cumbria, 8.15pm. Friday, May 1st, 2009. Gerry Richardson's Big Idea. Community Theatre, Saltburn, North Yorkshire, 7.30pm. Thursday, April 2nd, 2009. Chameleon. The Black Horse, Darwen, Lancashire. 9pm. Saturday, January 31st, 2009. The James Taylor Project. Lanercost Cricket Pavilion, Lanercost, Cumbria. 8pm. Sunday, December 14th, 2008. Chameleon. The Sparrowhawk, Burnley, Lancashire, 1pm. Saturday, December 13th, 2008. Chameleon. Zeffirelli's, Ambleside, Cumbria, 8.15pm. Friday, December 12th, 2008. Chameleon. The Swan & Royal, Clitheroe, Lancashire., 8pm. Ribble Valley Jazz & Blues. Monday, November 10th, 2008. Gerry Richardson's Big Idea. Newcastle College, Newcastle-upon-Tyne, 7.30pm . Sunday, November 9th, 2008. Alistair Anderson Band. The Sage Gateshead, 7.30pm. Folkworks' 20th birthday celebrations. Saturday, November 1st, 2008. The James Taylor Project. Community Theatre, Saltburn, North Yorkshire, 7.30pm. Friday, October 31st, 2008. The James Taylor Project. Zeffirelli's, Ambleside, Cumbria, 8.15pm. Thursday, October 23rd, 2008. Gerry Richardson's Big Idea. Georgian Theatre, Stockton-on-Tees, 7.30pm. Friday, October 17th, 2008. Tangent, with Stan Foster. Kirkstile Inn, Loweswater, Cumbria, 8pm. Saturday, September 27th, 2008. Gerry Richardson's Big Idea. Zeffirelli's, Ambleside, Cumbria, 8pm. Friday, September 5th, Saturday, September 6th, Sunday, September 7th, 2008. La Machine: Les Mecaniques Savants. Liverpool City Centre. Google for features, reviews & images. Saturday, August 23rd, 2008. Chameleon feat. Andy Watson . (Sextet). Zeffirelli's, Ambleside, Cumbria, 8.15pm The guitarists' guitarist returns to the band for one night only after a twenty-year break! Public performances only. Private functions excluded from this listing. James Taylor Project rehearsal, December 2007. Chameleon; 'Mean It', 1989. (Andy Watson). Written by great English guitarist Andy Watson, this was recorded live by Sveriges Riksradio (Swedish State Radio) in November 1989 at Umea Jazz Festival. The MC tells you who's playing. In Swedish, of course. Chameleon; 'Back Door', 1995. (Stuart Johnson). A slightly lo-fi live-in-studio version of a piece inspired by and dedicated to the great British trio Back Door (Ron Aspery [1943-2003], Tony Hicks [1948-2006], and Colin Hodgkinson) whose legendary gigs at the Lion Inn on the North Yorkshire Moors in the early seventies were a formative influence on Stuart. Features Bob Peacock, an old associate of Ron's, on piano, Adrian Rea, Hicksy's brother-in-law, on drums, and Aidan Lawrence, bass guitar. Produced by Damian Blackwell, the lo-fi is entirely due to the only surviving copy of this session being on a cheap ferric cassette tape. Chameleon; 'Four-Way Street', 1996. (Isaac Guillory). A trio this time; Race Newton, keyboards, Stuart - on wind synthesiser - and percussionist Paul Smith, with additional guitar from producer Mike Frankland. Race worked for many years with his fellow American, guitarist Isaac Guillory (1947-2000), and this is a tune they played together regularly. Not quite like this. Chameleon; 'MDD'', 1996. (Stuart Johnson). Kind of Ambient. More simple harmony. More trio as above. More harmon-mute wind synth. Some baritone sax. MDD? Miles Dewey Davis. Chameleon; 'Looks Like Meringue', 1991. (John Scofield). Unearthed in May 2007 along with several other live-to-stereo recordings from tour dates in Belfast, Norwich, Newcastle & St. Helier. More to follow when the necessary digitisation has been done. Features Paul Brown (Guitar), Aidan Lawrence (Bass), Adrian Rea (Drums), Race Newton (Keyboards) & Stuart Johnson (Wind Synthesiser), with sound engineering from Colin Wilson at Compact Audio. We think this one is from Live Theatre, Newcastle, on November 17th, 1991. Chameleon; 'Fine Lines', 1991. (Andy Watson). Another one of Andy's great tunes, although he doesn't play on this recording. Also from May 2007's archaeological dig featuring the same line up and instrumentation as above from, we think, the same gig. Chameleon; 'Fine Lines (1)', 1991. (Andy Watson). Another version of the above, recorded in Belfast on November 13th, 1991. Chameleon; 'Yesterdays' 1995 - we think. (Jerome Kern) & 'Autumn Leaves' (Joseph Kosma/Johnny Mercer). Two standards, found during a loft clearance in November 2009. A trio; Bob Peacock, Piano; Keith Peberdy, Bass Guitar & Stuart Johnson, Soprano Saxophone. Without question, Race Newton (1927-2003) is the single musician who has most affected my life. His great piano playing, prodigious intelligence, wisdom and joyous sense of humour touched all who knew him. Every moment spent with him was a lesson in how to live a decent life. He was the best company you could possibly have, and a remarkable human being. We all miss him every day. Tangent: Cocktail Jazz Duo; Function/Dance Band with Vocalist; Background Music. Tangent; 'Alone Together', 2007. (Howard Dietz & Arthur Schwarz)....and more. Tangent; 'I Loves You Porgy', 2007. (George Gershwin).....and more. Many thanks to studiomeister Dave Turner for these three first-take recordings. Tangent + Brian Dales; 'How Sweet It Is', 2008. (Holland-Dozier-Holland). Junior Walker's Motown masterpiece, although this version is pretty much James Taylor's cover. Watch out for James Taylor Project recordings here & extracts from the band's DVD recorded in concert in November 2008. Coming soon. Tangent + Brian Dales; 'Chasing Cars', 2008. (Snow Patrol). Contemporary indie classic. Tangent + Brian Dales; 'Save The Last Dance For Me', 2008. (Doc Pomus & Mort Shuman) An interpretation of Michael Buble's latin version of The Drifters/Ben E. King perennial. Tangent + Brian Dales; 'Home', 2008. (Michael Buble) Fine ballad written by the great young Canadian vocalist. Tangent + Brian Dales; 'Beyond The Sea', 2008. (Charles Trenet). Classic swing tune from the repertoire of everyone from Sinatra to Aznavour. Tangent + Brian Dales; 'Just The Two Of Us', 2008. (Bill Withers). The evergreen seventies' soul anthem. Tangent + Brian Dales; 'Fields Of Gold', 2008. (Sting). Minus live Northumbrian pipes, alas - but they can be arranged! Thanks to our old friend Mike Frankland for his production on these seven tracks. Stuart Johnson; 'Ice & Fire', 1997. (Stuart Johnson). 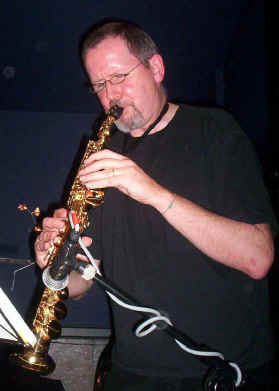 A piece for bass clarinet and sequencers, produced by Mike Frankland, and written for Dodgy Clutch Theatre Company's ambitious 'Street of the Moon', staged over five nights on boats and floating stages on the River Tees, England, in August 1997 as part of Stockton Riverside International Festival's Tenth Anniversary celebrations. Big Band; Voice of the North. Another neglected tape recovered in November 2009. These are the first four digitisations of a recording made by The Voice of the North Jazz Orchestra at Harrogate International Festival, England, on July 31st, 1998. MD & solo tenor saxophone Tommy Smith, with Mark Nightingale (trombone) and Bruce Adams (trumpet) as the other guest soloists. This concert, and subsequent ones, were originally intended to present three of Duke Ellington's great suites in their entirety; 'Such Sweet Thunder', 'The Queen's Suite', and 'The Far East Suite'. Realising that this would take well over three hours and destroy everyone's chops, the eventual performances presented substantial sections of all three works, and still destroyed everyone's chops. Stuart plays baritone saxophone & bass clarinet throughout. VOTN-Ellington; 'Depk', from' The Far East Suite'. Stuart takes the odd and tricky theme on baritone with Richard Ingham, clarinet. VOTN-Ellington; 'Tourist Point of View', from 'The Far East Suite' . Great tenor solo from Tommy Smith. VOTN-Ellington; 'Le Sucrier Velours', from 'The Queen's Suite'. Classic Ellington textures & voicings for reeds. Unmistakeable. VOTN-Ellington; 'Madness in Great Ones', from 'Such Sweet Thunder'. In which Bruce Adams gives Cat Anderson, the Ellington band's high-note specialist, a run for his money. Further big band tracks from a substantial rediscovered archive currently being prepared, including more from the Ellington concert and some pieces with Andy Sheppard. Gerry Richardson's Big Idea. Title track from the album 'So Many Reasons', released December 2012. Move cursor over titles to scroll up and down, then single-click to play. Frank Zappa at the same venue in Newcastle a few months later, February 1979. 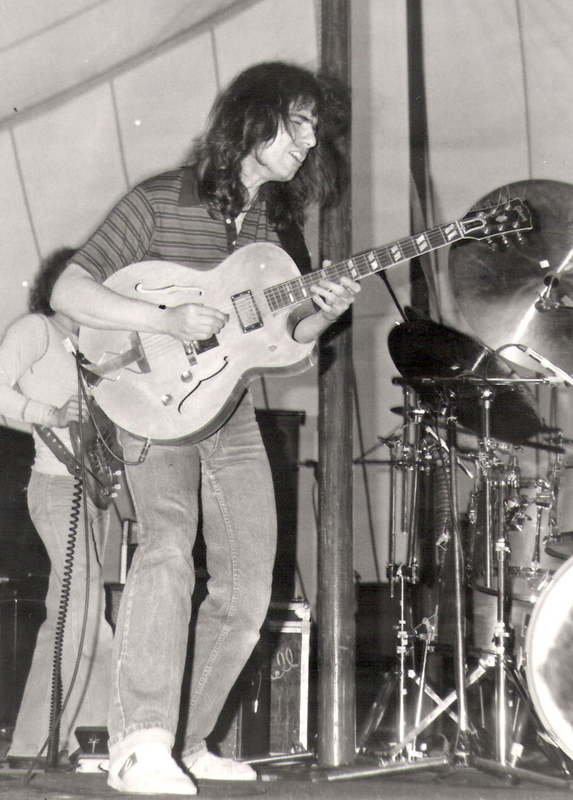 And a youthful Pat Metheny in a tent. 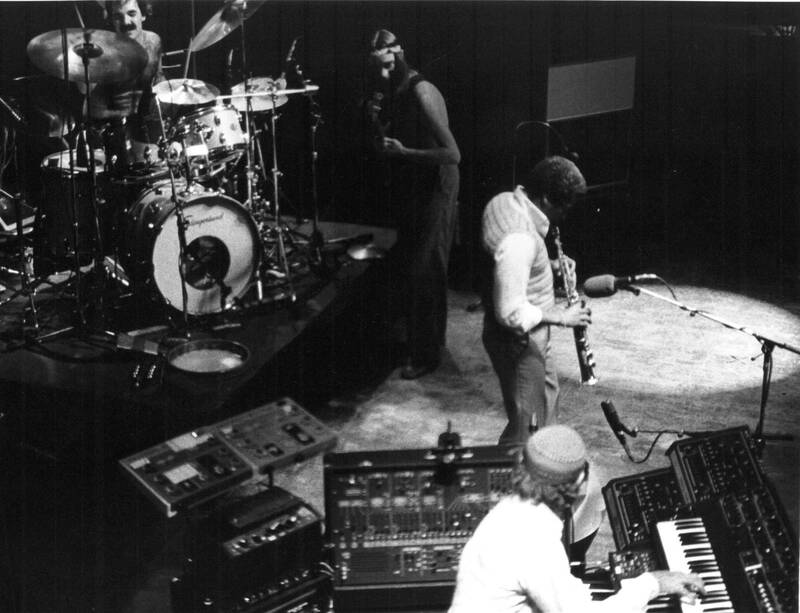 Bracknell Jazz Festival, England, July 1980.